OK, readers, it’s time for a little geography quiz. Where are these towns located? See, you can learn a lot by going online and reading information on sites like Minnesota Prairie Roots. But not everyone has easy access to computers, or the technical skills to use one, especially in rural areas like those six small Minnesota towns in the list above. The folks in Lac qui Parle County understand that. And they’ve done something about the problem by bringing computers to the people via a mobile computer lab, LqP Computer Commuter. How’s that for an innovative idea, selected as one of 30 Minnesota Community Pride Showcase winners that will be recognized on Saturday at the Minnesota State Fair? Back in Lac qui Parle County, the computer commuter (a converted small handicapped accessible commuter bus) hit the road last summer and now travels three days a week, parking for four hours in each town—Bellingham on Monday morning, then to Nassau in the afternoon; to Madison and Marietta on Tuesday; and to Dawson and Boyd on Friday. According to information submitted in the Minnesota Community Pride Showcase application, the mobile program has been well-received and continues to grow. You can read details about LqP Computer Commuter by clicking here. 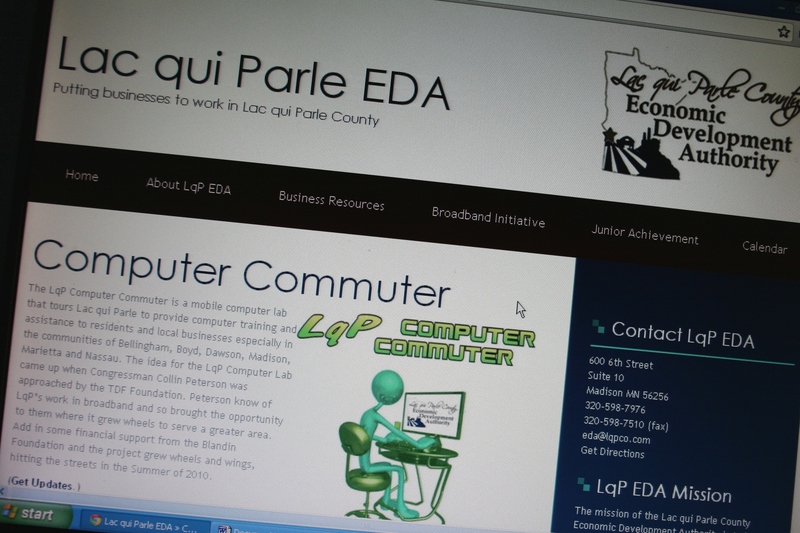 The Lac qui Parle Economic Development Authority website, where you'll find basic info about the LqP Computer Commuter. Aiming to increase digital literacy in a county with less than 8,000 residents, many of them over age 60, the mobile computer lab provides the public with free access to seven laptops and a lab coordinator and trainer. Twelve local partners from the public and private sector support the project. To the team who brainstormed and hatched this idea and to those who back the program, I applaud you. You are meeting a need in rural Minnesota. I understand. I grew up in southwestern Minnesota and am aware how isolation, lack of funding, and more, often mean fewer opportunities. When I was a child living on a farm outside of Vesta, I wanted nothing more than a library in town. Decades later my hometown of around 300 still doesn’t have a library, but at least the Plum Creek Bookmobile rolls onto Main Street once a month. I expect residents and business people in Lac qui Parle County are thrilled to see the LqP Computer Commuter roll onto their Main Streets once a week. I hope this idea catches on in other areas of rural Minnesota, and through-out the country. Rural residents should have as much access to technology, and the skills to use that technology, as those of us who live in more heavily-populated areas. FYI: To read the list of winners in the Minnesota Community Pride Showcase, click here. The 30 winners will be recognized on Saturday at the Minnesota State Fair, where they also have an exhibit space. The fair has also awarded $500 to each winner. Three programs in my county of residence, Rice County, are among those to be honored for their community efforts: Faribault Summer Youth Programs, Rice County Olympic Day and Northfield LINK Center.